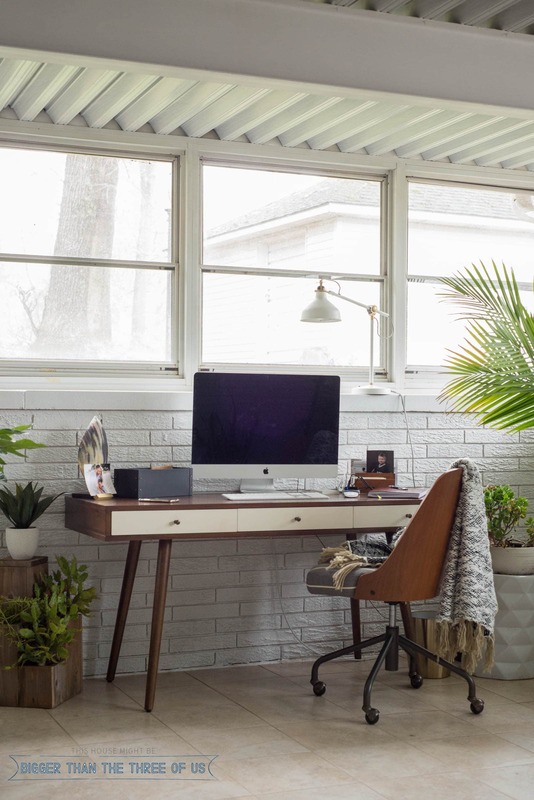 Today is the day that you’ll get to see my Sunroom Home Office Makeover. I was able to add storage, function and beauty and was able to partner with Tuesday Morning to do all of that. With large spaces, your furniture still needs to be able to “talk” to one another. 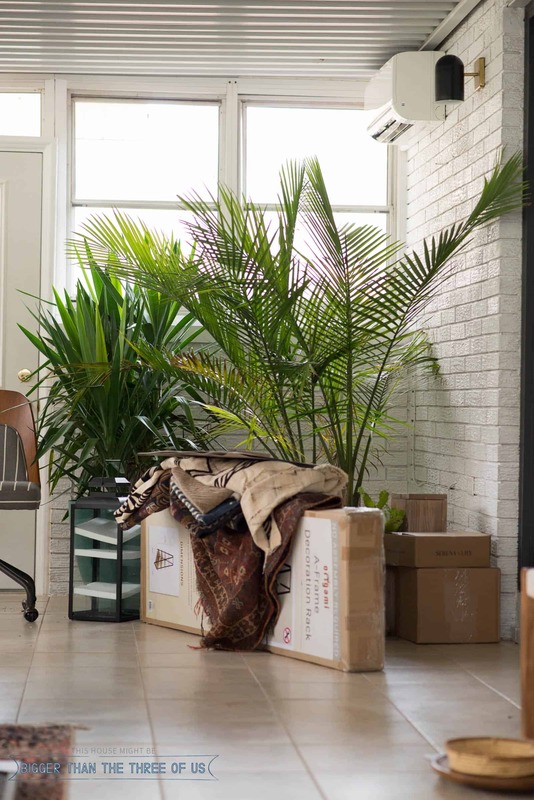 You can’t just pull your furniture pieces further apart to take up more space in a room. Sometimes, you need to think about how to create different zones within one room to make the room work for you. 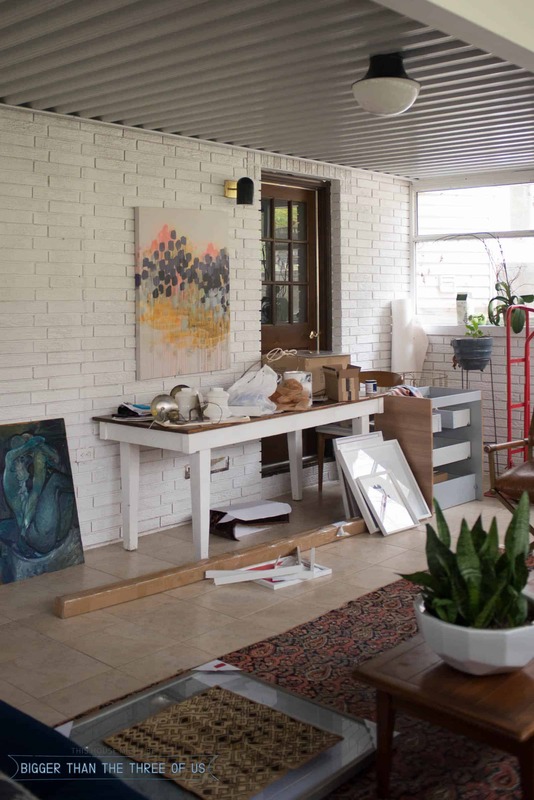 I’ll explain in just a bit how I created different zones in this space to make the space work; but first, let’s look at some pictures of what the sunroom office was looking like before I started this project with Tuesday Morning. Overall, I have project supplies everywhere, loads of plants that are just dropped wherever and a desk that has gotten no love with organization. I needed help and that was putting it lightly. I went in to Tuesday Morning hoping to find some major help with organizing (some sort of furniture piece, ideally), textural pieces and a few unique items that would add interest to my space. I was able to snag all of those items and more! If you aren’t familiar with Tuesday Morning, their products are handpicked by buyers from all over the world. You’ll find quality and designer pieces at crazy, low prices. So, are you ready to see my newly improved, organized home office space? 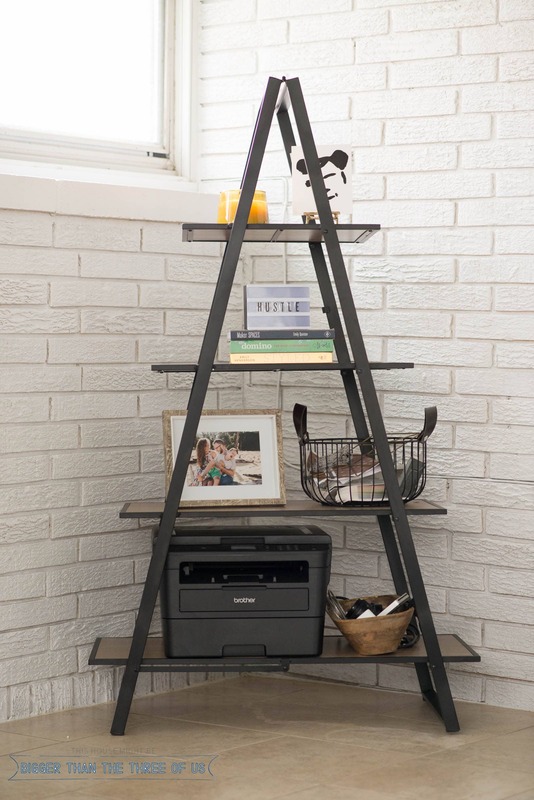 One of the first things that draws your eye, is the A-frame black shelving unit. I was happy to find that when I was at Tuesday Morning. The shelving unit helped create a “zone” in my space (remember how, earlier in this post, I talked about creating zones?). Well, zone #1 was creating a shelving unit organization area and I think it turned out pretty darn well. My office was sorely lacking in organization and needed functional organization that could also be something pretty to look at. The basket, wood bowl, picture frame and candle were all found at Tuesday Morning. I knew that I needed some vessels to contain samples and camera gear so I immediately went to the basket aisle to look for those. Personally, I love when you can store items that you use in everyday vessels right in plain sight. I don’t forget where I stored it and it’s easy to get to and looks great corralled in a wood bowl. It’s a win/win/win! The next zone that I wanted tackle was my desk area. I added a chunky knit throw (can you believe how beautiful that throw is?) to my chair and purged! I tried to hide some of the wires with plants. Moving the printer to the shelving unit really helped make the desk area feel more inviting. 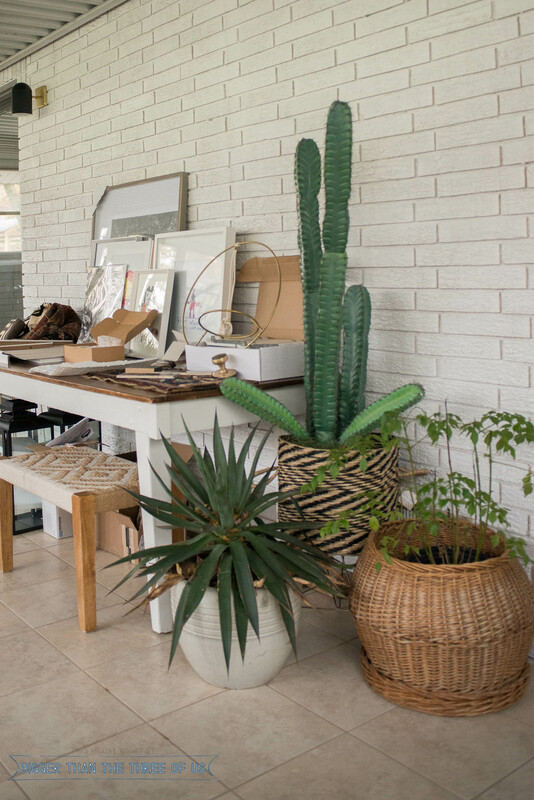 If you remember my goal in the space was to find textural items to help break up the white brick and cream flooring. 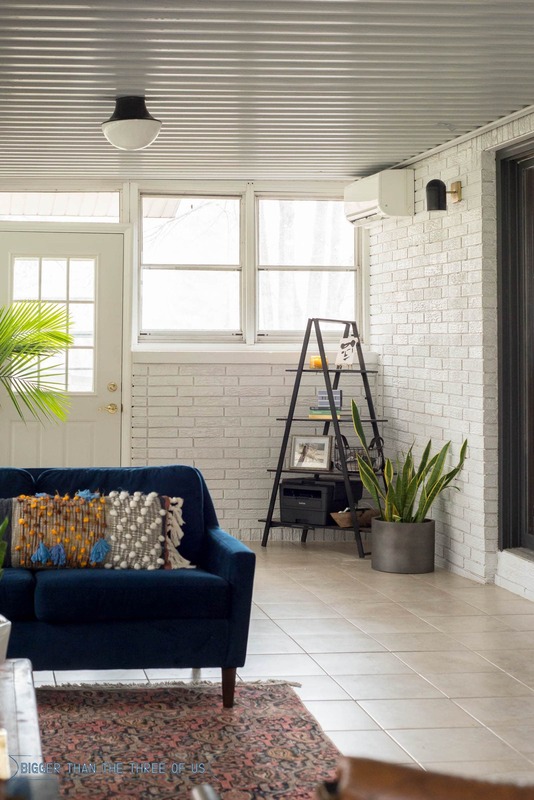 Well, I added a chunky texture rug and black and white woven basket to the back door to help liven up the area. 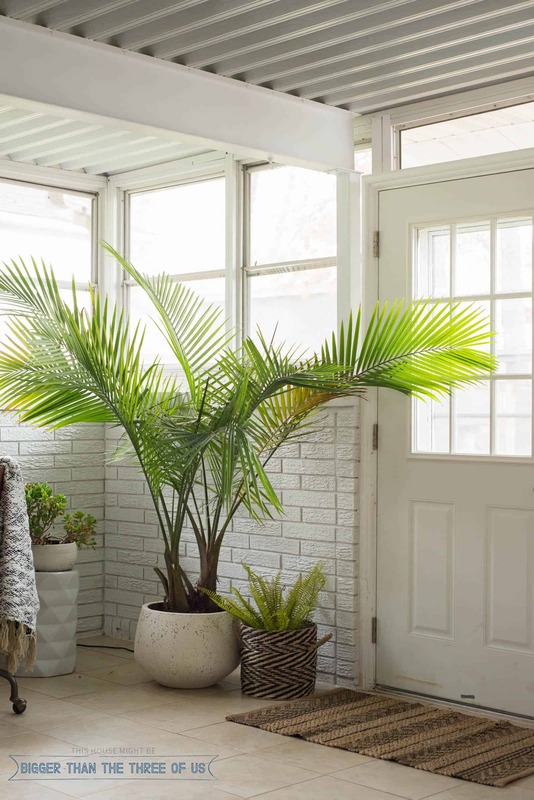 The door desperately needs a makeover but, until then, I think the texture and plants help break up this space and make the door less of an eyesore. Zone number three was streamlining my project supplies. In a perfect world, I’d have some of these hidden but I have so many different projects going on right now that it just makes the most sense for my project supplies to be displayed. Putting a little bit of effort into organizing my project supplies definitely helped though! And, adding more beautiful texture with another black and cream woven basket doesn’t hurt either. 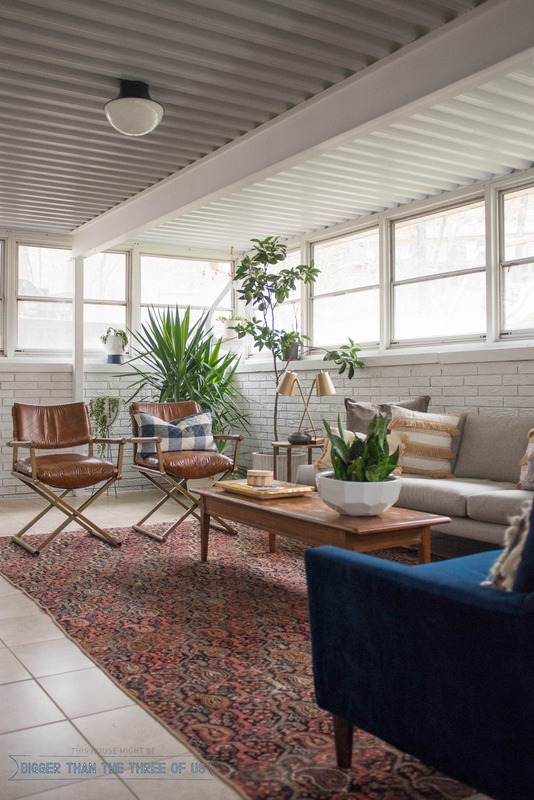 The last zone to tweak in the sunroom office makeover was the sitting area. 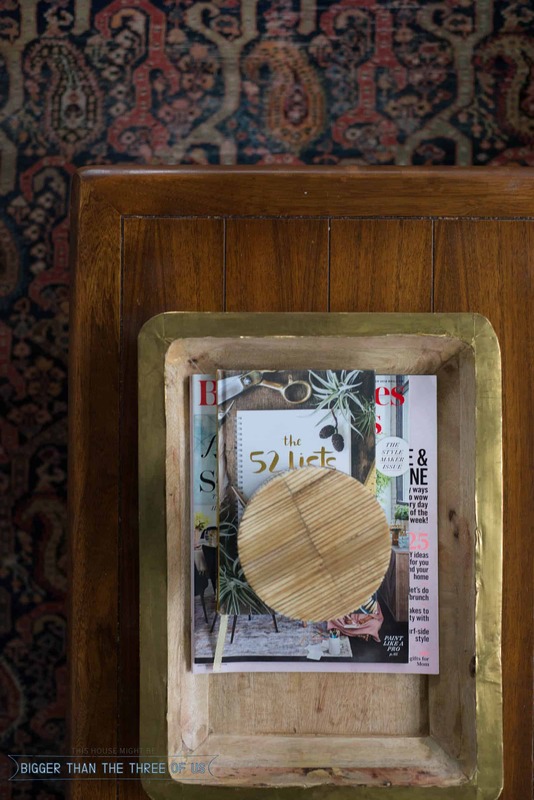 I basically needed some pretty pieces to style on the coffee table so I picked up a wooded tray and a unique wooden box. I’m pretty smitten with the detailing on the wooden box and, for $16.99, you wouldn’t believe how great the quality is! I love wood pieces, can you tell? 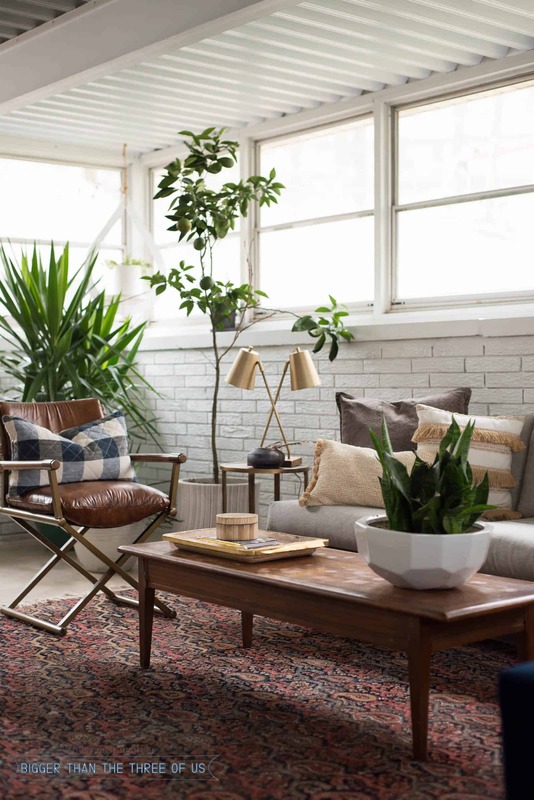 The sunroom office seating area is filled with plants, wood textures, vintage pieces and more and is so inviting. What do you think? 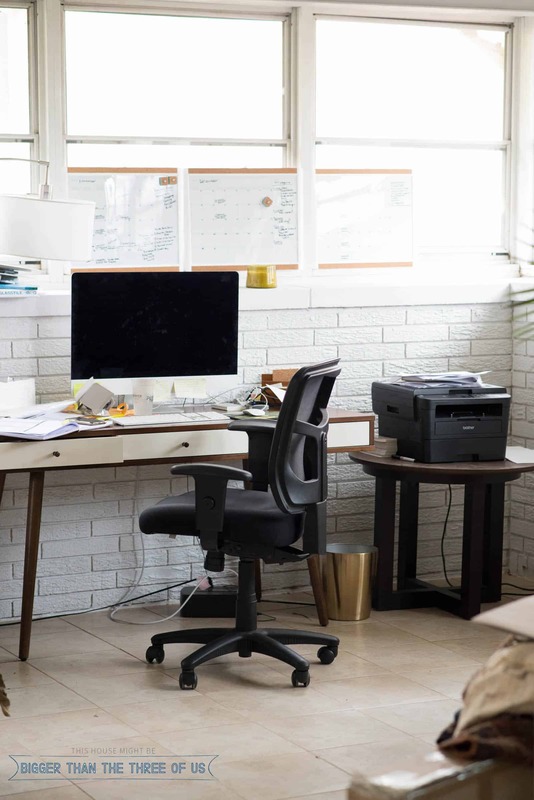 Could you be inspired to work in this space? 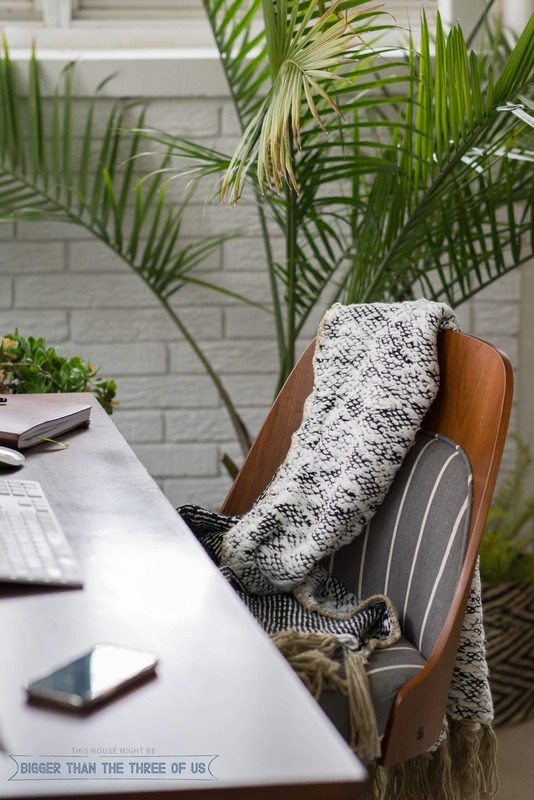 I feel so blessed to be able to call it my own and to have a space to write blog posts, enjoy a book or edit podcasts on the couch, see my projects pieces that are coming together and just be able to be inspired. It’s a dream-type space for me for sure. Remember: When you have large spaces, try breaking up your space into different zones so that each zone has a purpose! If you don’t know where your local Tuesday Morning is, use this store locator to find one and go snag some great pieces! This post is in partnership with Tuesday Morning, click to read my privacy and disclosure policy.